Tonight the Mariners open their season in Anaheim. Felix Hernandez takes the mound for the M’s, and at the age of 27, with most of a decade left on his contract, becomes the Seattle Mariners pitcher with the most opening day assignments. Amazing. My hope is the Mariners will be amazing tonight and for many of the 161 games that follow. I know I have been grouchier than all get out about the state of the Mariners, what they could have done this off season as opposed to what they did do, but I do that because I care, I really do. I love the Mariners, I always have, always will. I am a baseball person, and while I wish the Seahawks, Sounders, Thunderbirds, Storm and the ghosts of the Seattle Supersonics well, on my heart is blue and teal with a big S and compass rose. My father began taking me to baseball games, the original Seattle Rainiers, when I was a very small boy. I saw my first major league game in 1963, Giants vs. Pirates at Candlestick. I was eight and wore the hat I bought at the ballpark to bed. One of the worst days in memory, right there with the Kennedy assassination, MLK and RFK murders, and 9/11 was the news the Seattle Pilots would take their blue caps, scrambled eggs and all, and head for Milwaukee. Good bye Diego Segui, Mike Hegan, Don Mincher and the rest. Brad Miller–he’s shown he can hit, field and run and those are things we haven’t seen together for a while. He’s had an awesome spring, and now I want to see what he can do for this team over the course of the season. Abraham Almonte–I saw Almonte in Tacoma a couple of times last year and I was impressed. He’s a hustler and can make things happen when things are going right. My fingers are crossed. Stefen Romero–Guys who have good minor league bats, but without a true position always frighten me. Remember Vinnie Catricala and Mike Morse? But Romero is athletic, right handed and willing to play wherever. Reminds me of Mark McLemore without the speed, though Romero is no slug. Roenis Elias–He has such a great story. How can anybody not pull for this guy. He’s making a pretty big jump from AA, but it sounds like the he pitched well enough, the team had a need, and here he is. Hope he sticks. The rest of the rotation, Erasmo Ramirez, James Paxton, Taijuan Walker when he’s back in a few weeks and Chris Young will bear watching and more crossed fingers, but really two guys I’m very anxious to see aren’t young anymore, but as much as anyone the fortunes of the Marines may rest on their shoulders. Justin Smoak–I’ve always wanted to believe Smoak was the next Mark Texeira, a big switch hitting monster who could carry your team. I don’t believe that anymore, and I don’t think anybody does. But I do think Smoak can do a lot for the M’s if he can hit with some power, raise his batting average 20 points against both righties and lefties, and draw a few more walks. Smoak really did make progress last year, he just needs to make more. Dustin Ackley–If Ackley is the guy we saw in August last year, he could make this team a lot more fun to watch. He could be a .290 hitter with 40 doubles and speed on the basepaths. When he’s right, Ackley is the kind of player Safeco was built for. This is year six of Jack Zdurencik’s rebuild. In year one the Mariners won 85 games using pitching and defense to catch the baseball world by surprise. Last year they won 71 games using solo homers and bad defense and lost in ways easily predictable. Zdurencik had six years to return this team to respectability, yet it seems no closer to winning than it did at any point under Bill Bavasi. He had some success with a flurry of trades in his first season, netting Mike Carp, Jason Vargas and Franklin Gutierrez. Unfortunately none of them play here anymore, though we could use any and all of them. He’s had some major clunkers, notably the Doug Fister for a bag of magic beans deal, and the Michael Pineda for fat farm inmate Jesus Montero. Free agent signings have been more about quantity than quality, relying on dustbin bargains, rather than signing proven players who can help now. This year it was Scott Baker, Randy Wolf and Chris Young to fill out the rotation for Felix Hernadez and the various babes in the woods who will begin play next week instead of Ubaldo Jimenez, Ervin Santana or Matt Garza. What is most maddening about Zdurencik is his inability to articulate a vision of what a team looks like beyond a wall of component parts–a right handed bat here, a switch hitter there, a middle of the order bat somewhere in the back room. He’s failed to take advantage of Safeco field by building a team around pitching, defense and speed, and has instead focused on power hitters-a view at odds with Safeco’s most obvious challenges-its dimensions and power dampening climate. Finally, Zdurencik came to Seattle as a proven scout and talent evaluator promising to rebuild the team around a collection of talented youngsters that would remind those Mariners teams of the 90’s with emerging stars like Ken Griffey, Jr., Randy Johnson, Edgar Martinez and Alex Rodriguez. Yet all of the young players, except Kyle Seager, he brought up have failed to live up to expectations. This is the last year for him to show he can assemble an improving roster, with a cast of developing youngsters offering a glimpse of a bright future instead of a seemingly unbreakable cycle of losing, boring, inept baseball. On January 31 Kevin Mathers replaced Chuck Armstrong as President and Chief Operating Officer. At about the same time, the media began counting the Mariners pennies, learned the team would receive considerably more money from its national television deal and it’s decision to invest in Roots Sports. When he spoke to the public January 23rd Mathers promised things would be different, that money would be available for players the team needed to be a winner. Robinson Cano and Corey Hart signed with the M’s in December. The same day Hart signed the M’s made the trade for Logan Morrison. Since December the Mariners have done remarkably little. Despite committing two rotation spots to rookies, whether they are James Paxton, Taijuan Walker, Erasmo Ramirez, Roenis Elias or some lefty yet unborn, this team needed a number three starter. Though proven, healthy players were available who make this team better, and the markets for their services virtually collapsed, they went cheap for reclamation projects Scott Baker and Randy Wolf. Baker pitched pitifully and was released and in a bout of needless penny pinching Wolf was not included on the Opening Day roster. It is only by dumb luck that Chris Young, coming off thoracic outlet surgery, was available, but his signing was a panic move not the planful acquisition for a team that wants to win. The Mariners needed a right handed bat, yet didn’t acquire one through trade or free agency. While I was never a fan of a Nelson Cruz pick-up, the team is now depending on rookie, make that cheap rookie, Stefan Romero, to become the fourth right handed hitter on the team after Hart, Mike Zunino, and John Buck. The Mariners had one of the most explosive bullpens in the major leagues last year. Bolstering that bullpen was critical. They did sign closer Fernando Rodney to a two year deal for a great of money. But they let effective lefty Oliver Perez get away to the Diamondbacks for a two year $4 million deal, pennies on a major league roster and about one third Rodney’s salary. It is not bolstering to add with one hand while taking away with the other. The bullpen remains composed of last year’s Gas Can Gang, with the volatile Rodney as its ringleader. The M’s backed up the Brinks truck for Cano, did well by Hart and Rodney, but if a signing is to be more than show, more than bread and circuses, the stars have to have a supporting cast. It is possible all the kids who will take the field will shock us all and be the 2013 Red Sox. But we’ve done kids and it hasn’t turned out very well. Rumors abounded in January, February and March the Mariners were tapped out and couldn’t add the pieces they need despite the new revenue. Which is it a new day, or the same ol’ same ol. Kevin Mathers, Pete Towshend wrote: “Meet the new boss, same as the old boss. Won’t get fooled again.” Now we know you. I love Felix Hernandez. He is a great pitcher. ESPN.mlb named him the the number one right-hander in the majors in their review of the top 100 players in the game. When he is on his game, he is the best. And he needs to be, especially to start the season. The M’s rotation will be something like Felix, Erasmo Ramirez, James Paxton, Roenis Elias, and Chris Young. That’s the former Cy Young Award winner, three rookies, and a guy coming off a serious surgery who didn’t throw many innings in spring training. Until reinforcements arrive in the form of Hisashi Iwakuma and rookie ace-in-waiting Taijuan Walker return from injury, Felix will need to win virtually every time out or it could be a very long, unpleasant April. I’m not saying the kids can’t do it, but when they stumble it will eat up a fragile bullpen causing further problems down the road. Most of the April games are also against division rivals so if the M’s want to keep their fan base interested, they’ll need to win and the King is a key part of that. It would be nice to see him win in August and September too. Outfielder Michael Saunder is 27 years old, has played parts of five seasons with the Mariners and has 1656 plate appearances. “The Condor” is big, fast and athletic; he is touted as a toolsy kind of players. He was a Bavasi holdover and the Mariners have had high hopes for him. Yet Saunders has a career slash line of .224/.295/.374, and a career OPS+ of 89. His fortunes ticked up in 2012 with improvements he made at the plate, but an injury plagued 2013, set him back. This is a make or break year for Michael Saunders. In this, his first year of arbitration eligibility Saunders is making $2.3 million, not chump change. Fangraphs shows him worth 1.1 WAR in 2013. Steamer and Oliver projection systems show him as being somewhat improved this year to 1.7 and 3.2 WAR respectively. I’m not a big believer in projections; I like to count the numbers I see. If Saunders can stay healthy and improve at the plate, and if the Mariners are able to keep him in right field rather than center, Saunders can be a useful outfielder, if not he’s bench material. Justin Smoak was a number one draft pick for the Texas Rangers in 2008 and was the centerpiece of a 2010 trade deal that sent Cliff Lee to the Rangers, and the Rangers to the World Series. Smoak is 27, has 1,942 major league plate appearances and a career slash line of .227/.314/.386, a career OPS+ of 97. In major league baseball much is expected of first basemen. They need to hit for average, produce with power, and play a little defense. Much was expected of Justin Smoak and honestly the big switch-hitter hasn’t come through. We get snippets, glimpses of the player we want him to be but there’s been no consistency. For many fans, Justin Smoak is the poster boy for what is wrong with the Mariners–trading a star for a future star who flames out. Smoak showed signs last season. His OBP went up 40 points, batting average up 20 points, he hit 20 home runs for the first time, his OPS+ went up to 113. But it’s clear there are holes in his game. He doesn’t hit lefties, he’s slow, and while he catches what he can get to, and can turn the double play, he doesn’t have much range. Going into spring training, manager Lloyd McClendon ratcheted down expectations for Smoak and advised him not to try to be the 35 homer masher we all hoped he would be, to concentrate on being a good hitter, and hope for a higher doubles rate than the measly 19 he produced last year. I want to believe, I really do, but if Smoak can’t finish the year with something like a .260/.350/.450 slash line with 20ish home runs and 30ish doubles, rapidly advancing 2013 first round draft pick D.J. Peterson may be breathing down his neck next year and the Smoak era will end. The stats don’t like Smoak much. He is credited with .4 WAR in 2013, and projected for .4 and 1.0 by Steamer and Oliver respectively. Sigh. Dustin Ackley was the second player taken in the 2009 draft, was and still is regarded as the best hitter available in that draft. After an impressive debut in 2011, Ackley seemed to lose confidence in his hitting ability and has really struggled. Ackley is the youngest, at 26, of the three players on the hot seat, has the fewest major league plate appearances with 1,471. After a promising 2011 debut, Ackley disappointed in 2012 and seemed so lost at the plate, he was sent to AAA and moved from 2B where he was a Gold Glove candidate, to the outfield. On his return Ackley was a completely different hitter. His first half slash line was .205/.267/.255 but when he returned from Tacoma he was .304/.374/.435, though his outfield defense could charitably be called shaky. By all accounts he’s had a very good spring, hitting the ball hard with a .394/.420/.621 slash, and appearing more confident with the glove. Ackley offers doubles power and speed to a thin outfield mix. So which is it, the struggling clueless player or the new improved version. His play must improve if the Mariners are to improve. These three players are now veterans. Despite their shortcomings, the M’s lost offensive production by Raul Ibanez, Kendrys Morales, and Michael Morse. These guys will have to provide offensive leadership by taking the next step forward in their development and providing some support around Cano and Hart. If they fail to do so I can see some or all of them gone. This is an important year for the Mariners. Their investment in a ten year deal for Robinso Cano is hopefully a down-payment on a better future. However the playoffs are an unlikely outcome for 2014 as it seems this is another year to examine and evaluate the talent we have. I’ve been pretty negative this spring. I’ve pointed out failings in the front office, as well as what I believe are realistic missed opportunities to put players on the field that could make this team a contender this year in what looks to be a weakened, injury-plagued division. And in the end, the Mariners still might contend. They simply have so many unknowns and question marks that if they all break the right way they could win 90 games. Do I think that will happen? No, but certainly isn’t impossible. But win 90 or lose 90, here are some reasons the M’s should be more interesting. Interesting article the other day by Jeff Lindholm at Beyond the Box Score on rating managerial effectiveness. I think it’s way too early to determine whether Lloyd McClendon is an effective manager on the order of Joe Torre, Tony LaRussa, or Bobby Cox. But I’ve been impressed with his candor. The man does not live in Jack Zdurencik’s world of lollipops and rainbows, constantly selling something that isn’t there. When spring training began he pointed out the team’s execrable outfield defense, and by god he did something about it. He insisted on competition for roster spots, and there’s been some. It remains to be seen if McClendon is able to hold players accountable for their poor performance, but he will be tested and by July I’m sure we’ll have our answer. More than that, this feels more like a team that a rational, logical person with baseball knowledge would assemble rather than a collection of bits conveniently categorized by wishful thinking. The outfield is composed of guys who can play the outfield. Infielders are playing in positions they should be playing. The rotation and bullpen, well, we’ll see about that, but when you’ve got guys hurt that’s always a challenge. That doesn’t mean they are the most talented players at their positions in the major leagues, but they are the best guys in this organization at those spots. That’s McClendon’s doing, and he doesn’t make excuses for management or the players. McClendon was a refreshing hire, and so far I’m a fan. If you love the Seattle Mariners, and despite my grumpy old man posts I really do, you have to like the Robinson Cano signing. I won’t discuss the costs in years 6-10, but this year he will make this team better. Look what he’s done since his signing. Cano is relentlessly positive. Despite his occasional breakdowns when he plays general manager and urges a signing on the team, he seems committed to making Seattle a winner. All accounts suggest he’s happy to be in Seattle, and he’s taken a leadership role this team hasn’t seen since the days of Edgar Martinez and Jay Buhner. He is the opposite bookend to Felix Hernandez, a guy who can lead the guys on the diamond every day, as Felix leads the pitching staff. Set aside all the past losing and think for just a minute. Good teams, great teams start with a Robinson Cano and the M’s haven’t had a guy like him in a long time. The dollars will sort themselves out later, it’s not your money. These are intangibles, aside from the fact that he brings a proven middle of the order bat for the first time in ages. This netted out for all innings played to 58 runs allowed above an average outfield, the worst in baseball. The net effect is it makes pitching staffs worse, prolongs innings and rallies, and loses baseball games. The outfield defense should be better, the question is how much? The decision to move Corey Hart to DH and minimizing Logan Morrison’s presence in the outfield is key to their success. Both are coming off major knee surgeries and before their injuries were not very good defenders. Abraham Almonte is a key to determining how how much better they will be. Almonte was a decent minor league center fielder, if he can hit well enough to keep himself in the lineup. Reports are that Ackley has improved his play in the outfield, looks less lost and is taking better routes to the ball. If Almonte can handle centerfield, it keeps Michael Saunders in right, which is his strongest position. Is this outfield going to take us back to 2003 with Mike Cameron, Ichiro and Randy Winn? Don’t be silly. But it may get the team closer to league average and that would be a vast improvement over last summer’s Outfield of Broken Toys. The Mariners continue to experience their first youth movement. Michael Saunders, Kyle Seager, Dustin Ackley, Justin Smoak are those I include in this group. Unfortunately it hasn’t turned out so great. With the exception of Seager, the other three have been disappointments and I would suggest they are on the hot seat for this year. Either they produce or places will be found for them elsewhere. This year is the full expression of another wave of young players on to the big club. Brad Miller, Abraham Almonte, Mike Zunino and Stefan Romero will all play prominent roles on this team–with the exception of Romero, all Opening Day starters in key positions for their first full year in the majors. These are all players who can make this team better and have the potential to supply meet needs this team has really lacked. Miller is an exciting young player who has looked good in the field and at bat. He brings speed to a team that’s largely lacked it. Almonte could be at least a stop-gap in centerfield. He’s probably better suited to the corner, but he hustles, can hit with a little power, and has a strong arm. Zunino is simply the best defensive catcher the Mariners have had since Dan Wilson retired. He also has considerable promise at the plate, but has little minor league experience to hone his offensive skills. Romero brings a much needed right handed bat with the athletic skill to fill in several positions. Each one of these players has the potential to upgrade the Mariners at all of the positions they play, but potential is just another word for keeping one’s fingers crossed. Hopefully we can check their boxes off at the end of the season by mission accomplished. The reliance on so much youth make betting on the Mariners extremely exciting as one gets a potential glimpse at the future, but betting on their success seems like one big crapshoot. It’s difficult to see this turning out real well in the short term, especially based on the performance of the first youth movement, but I am anxious to be surprised. This team has tons of potential and now it’s time to see if it pays off. Tuesday Massacre: triumph of the kids. With the start of the season a mere five days away, the Mariners roster is shaping up. The Hot Stove and Cactus League seasons will soon be memories and we’ll be up to our necks in the daily grind of pitching, catching and hitting baseballs, reading box scores, clapping our hands or swallowing Excedrin. When the HSL fired up in November, I stated pretty clearly what I believed the Mariners needed. First on the list was good, veteran center fielder. They could have coughed up the bucks for Jacoby Ellsbury. They could have traded for Peter Bourjos or Dexter Fowler. This team needs a talented fly-catcher, somebody who can really catch balls. The Mariners didn’t get one, and it remains to be seen if Abraham Almonte is an upgrade over the Michael Saunders/Endy Chavez/Dustin Ackley triumvirate that patrolled position 8 for the M’s in 2013. It’s not clear he can hit enough to stay at the major league level. But Zdurencik and McClendon have chosen the to heap burdens on the 24-year old. The Mariners went in to November with Felix, Iwakuma, and a host of youngsters to fill their rotation. I suggested the M’s sign at least one of the veteran pitchers available. With a protected first round draft pick, the M’s were less exposed to risk than many other teams who took on Matt Garza, Ubaldo Jimenez, Ervin Santana, or some of the lesser availables like Chris Capuano. When Iwakuma and Taijuan Walker turned up injured, followed by Brandon Maurer, they erased one of the best number two starters in baseball, and stripped out the depth of their young stable of starters. Instead of paying for veteran certainty, the Mariners took the cheap route, signing injury reclamation projects Randy Wolf and Scott Baker. Baker flamed out, and the M’s played patty-cake with Wolf’s contract status leaving Felix and four young ‘ens. For the first three to five starts of the season, the M’s will have a starting five that looks something like The King, James Paxton, Erasmo Ramirez, Roenis Elias and Blake Beaven. It’s a group with little experience, and if one of them goes sideways there is little to replace them inTacoma. In retrospect, not signing a healthy veteran arm seems like a mistake. Failing to agree with a utilitarian Wolf for what seems like a pittance in baseball dollars for a guy who will provide some experience and depth also seems foolish. Though Texas and Oakland have their own pitching and injury problems, they may be better able to withstand them. It’s all on the kids now, and it’s all on the bullpen if they crash and burn. I was excited by the Robinson Cano signing because he was the best free agent available. He offers a veteran bat, a championship presence, and a high quality glove this team needs. I was happy about the Corey Hart signing, but confused by Logan Morrison, because it seems to me the M’s created a logjam at DH. Neither one of these guys are players to run out to the outfield on a regular basis. My prediction that Hart would not play much outfield has come true. Maybe that’s a good thing as the M’s take a long hard look at Stefan Romero. The young right-hander has had some big hits in Spring Training, and shows some athleticism. But it remains to be seen if he can translate that to the major leagues. The Mariners are relying a great deal on their kids to succeed this year. For some, Dustin Ackley, Justin Smoak, and Michael Saunders, its probably their last shot with this team. They improve or they are done. They are depending on a new crop of kids to take them to the next level-Brad Miller, Abraham Almonte, and Stefan Romero. And that leaves aside the very green rotation. We don’t know what we have, so it’s hard to be dismissive, but it seems like a lot to expect this team to be very much better than it was last year. It seems the outfield will be more athletic and thus not as terrible defensively. The team has the potential to be better offensively, but it’s just potential. The pitching rotation looks downright scary, but that’s just based on its lack of experience. You be the judge. How much better than 75 wins is this bunch likely to be? The Cactus League season is more than half over. The Mariners sit at 13-5 a just behind Cleveland for the season lead. I’d like to get excited, but the facts are that when the boys from Sea-town have a great spring, they have a horrendous season. Drawing any conclusions from spring training records is for suckers. Manager Lloyd McClendon has given rookie Abraham Almonte every opportunity to win the centerfield job. Hoping to improve the centerfield defense with a legit fly catcher, McClendon has run him out as a starter almost every day. Almonte is getting the look see, and it seems he has the range to make the plays. What he hasn’t shown is a consistent bat. His .121/.189/.242 slash for spring is not impressive. Even so, McClendon must be seeing something he likes as his young competition in the form of Xavier Avery and James Jones were both sent to minor league camp. If Almonte continues to struggle at the Cactus League dish, will McClendon give the nod to incumbent CF Michael Saunders? That remains to be seen, and he ain’t sayin’. Is Corey Hart the second coming of Franklin Gutierrez? Corey Hart is penciled into right field for the Mariners. He is also coming off micro fracture surgery on both knees. He is one of the few right-handed bats on this team. It’s unclear how healthy he will be over the long season, how many games he can play in the outfield, or whether his outfield defense will be of sufficient quality to keep him there. The Mariners seem to be counting on Hart to play right field. McClendon stated he’s counting on him to play 145 games in right. I would suggest that if Hart could play 125ish games in right, it could be a key to improving the Mariner lineup. But if Hart has to play tons of time at DH or 1B due to his physical condition, it makes much less sense to add Kendrys Morales to the team. Adding the switch-hitting Morales to the very left-handed team would be smart if there weren’t Logan Morrison, Justin Smoak, and Hart logjam competing for at bats at DH and first base. It was not encouraging that Hart missed four games this week with back and forearm injuries when the M’s are already taking it slow with him. The M’s counted on Franklin Gutierrez last year, and losing him to chronic injury was an important component to their failure on the field. Hart’s health has the same importance. The messy rotation picture remains messy. It’s Felix Hernandez and four guys named Moe. It just isn’t clear how good or bad these guys will be. With Iwakuma and Walker likely to miss most or all of April, and with so many games against division foes, the M’s could be looking up in the standings from a many floors down. How well the James Paxton, Scott Baker, Erasmo Ramirez, Blake Beaven, Hector Noesi, Randy Wolf crowd can perform will be important. Given yesterday’s massive implosion by the bullpen, the rotation has never seemed more important, less certain, and more tenuous. With another pitching injury, a minor one to Brandon Maurer that will keep him from being available in April, it’s a reminder that constructing a pitching staff is one part talent, one part health and one part luck. The M’s will wish they signed one of the free agents available by the end of May. You read it hear first. Manager Lloyd McClendon isn’t likely to win many games for the Mariners in 2014. But his transparency, his willingness to say what’s on his mind is a breath of fresh air. Though he’s defended his guys, he’s also not afraid to identify problems. That’s a big change from past procession of M’s managers that pretty much defended Mariners management, and tried to make nice with the players. McClendon doesn’t seem like the kind of person to wait until he’s a month out the door as Mariners manager to publicly blow up his bosses if they are simply the same ol’, same ol’. Reports are there was no money to spend on Ervin Santana or Kendrys Morales despite big bucks from the national media contract and the Root Sports acquisition. You be the judge. It’s getting difficult to see how this team can contend this year. The Cano signing was the one guaranteed improvement on this team. The outfield defense could be better than 2013. The offensive performance of Dustin Ackley, Justin Smoak, Brad Miller and Mike Zunino might improve. The rotation quality is so untried, so coming off serious injury as to simply be Felix and a wing and a prayer. This team is not going to contend in 2014. It is getting more difficult to see it as a .500 team. Today Randy Wolf got roughed up in his start today as he attempts to come back from Tommy John surgery. No need to make too much of this. It’s Spring Training and it’s hard to put too much stock into what happens there. But improving the Mariners’ pitching is something that shouldn’t be ignored. Today the Rangers announced they’ve signed former Mariner rotation hole, Joe Saunders. The Diamondbacks announced they’ve reached a two year deal with lefty reliever Oliver Perez. While Saunders was a turd, Perez was definitely a useful piece–a lefty who could get right handed batters out as well, and it will be a loss to this team no buckets of Joe Beimels, Lucas Luetges and Zach Miners can replace. Two years, four million dollars. Penny-wise, pound foolish. Teams should acquire and keep players that make them better, and Perez would have made the Mariner bullpen, a terrible bullpen last year, better. They will pay Fernando Rodney seven million dollars this year. Is Rodney more than three times more valuable in his role than Perez was in his? Somebody has to get leads to the ninth inning. The Mariners have few opportunities left to make themselves better. I’m not sold on signing Kendrys Morales as some, such as Robinson Cano, are urging. Morales is a useful bat, but with absolutely no flexibility. He’s a DH, period, the end. Unless they can engineer a trade involving Justin Smoak or Logan Morrison, it isn’t a signing that makes sense. 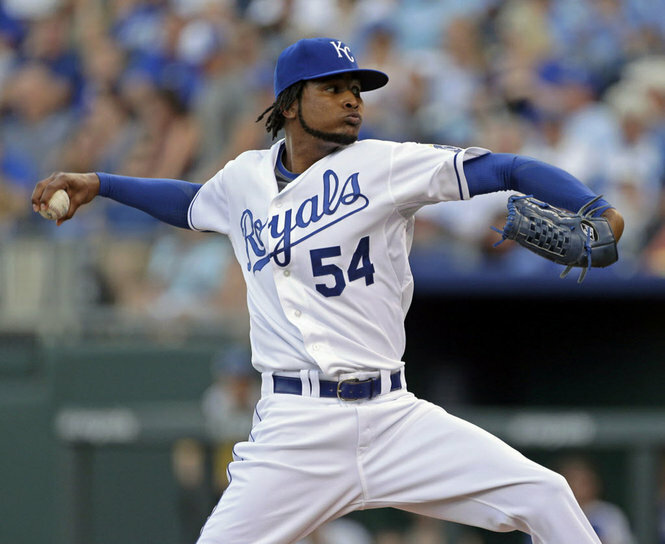 However, signing Ervin Santana makes lots of sense. Today Ken Rosenthal of Fox Sports announced he would be willing to sign a one year contract, probably in the same range as Ubaldo Jimenez, say $12.5 million. In a multi-year deal, such as the four he’s reportedly been demanding, the M’s would be committed to a considerable sum. For a one year deal, the M’s should be running to the front of the line for his services with a bag of cash in each hand. What do you get with an Ervin Santana? Weellll, sometimes it’s hard to say. Santana has had some monumentally bad seasons. In his nine seasons, he’s had three clankers-2007, 2009, and 2012 were serious stinkers. But in three of the last four, and the other years when he wasn’t putrid, Santana was good for 200+ innings, decent K/BB, K/9 numbers, and ERA+ of 100-127. His Achilles heel is the long ball, even in good years. Buster Olney pointed out another hesitation teams may be having and that is the state of his elbow tendon. Because Santana throws so many sliders, and sliders are so hard on the elbow, there is a legitimate concern for his arm health. Yet, a one year deal carries much less risk, gives the M’s a chance to evaluate their mid-term needs, and determine whether Santana fits in them. Again, there is no question Santana makes this team better. The rotation is already thin with the injuries to Iwakuma and Walker. There is no guarantee that guys like Scott Walker and Randy Wolf can come back this year from their very serious injuries. We don’t know what we have with James Paxton and Erasmo Ramirez. Sadly, we do know what we have with Blake Beaven and Hector Noesi. There will be injuries. There may be flame-outs. The Mariners will need depth. Let the pitchers from the pile earn their spots. Jack Zdurencik and Lloyd McClendon preach competition. Let them put their money where their mouths are. This is a good signing. Just do it. Can the Mariners Contend? It’s All About the Kids. Last spring at this time, while having a beer with friends, we were uniformly in agreement the Red Sox would be terrible. Shows what we knew. I split with the same group of friends over the Mariners and suggested they should win 81 games. I was painfully optimistic in my outlook, swept off my feet by the offseason acquistions of Morse, Ibanez, and Morales, and naively believed the reclaimed broken parts that were Jon Garland, Jeremy Bonderman and the youthful enthusiasm of Brandon Maurer could make it okay. Of course I was disabused of these happy thoughts by the end of May when the M’s bullpen did a quadruple implosion, were swept by Cleveland, the losses spiraled out of control and the season was, for all intents and purposes, over. It’s been a painful ten months since then, and I’ve become much more cynical in my judgments of Mariner management, and what they did and did not do this offseason. With three games under their belt in the Cactus League, and another thirty to go, it’s probably safe to begin asking the questions that will safely allow us to make predictions about the coming season. The problem with Mariners predictions is that so few positions are settled with proven producers that the questions are many and the answers are few. Robinson Cano, a truly remarkable player and pick up for this team is settled at second base and should be an offensive force. Kyle Seager has had two productive years at third base. Felix Hernandez will lead this pitching staff. Fernando Rodney will be the closer. That’s what we know, everything else is a blank space waiting to be filled in. Can Corey Hart play 130-145 games in the outfield? Hart’s ability to go out and play the outfield most days is a key to the success of the team. If Hart can play a below average right field (as opposed to truly wretched) and provide some right-handed offensive support to Robinson Cano in the batting order it would make a significant difference. It will unscramble the 1B/DH picture and clarify the outfield mix. Will this happen? No idea, and we’re not likely to have a clear picture until we get well into the season. How bad will the outfield defense be? Last year the M’s had the worst outfield defense in the majors, and nobody else was close. This year’s defense is likely to be bad, but not as truly vile as last year’s. Hart was a minus defender before his knee surgeries. What balls will he get to after his surgeries? The team has no true center fielder. Michael Saunders is playing out of position in center, and it’s clear he is being challenged by Abe Almonte, Xavier Avery and perhaps others. Can whoever wins the job net out an average center field? With the off season to prepare, will Dustin Ackley be a more effective left fielder than he was with last year’s -10.3 UZR/150 rating? If he can get closer to a zero, if the Mariners outfield defense can be closer to average, it provides a huge boost to the pitching staff. Can this happen? Errr . . . .
With the M’s injuries to Taijuan Walker and Hisashi Iwakuma, the M’s are flat out in a hard way. Iwakuma’s finger injury seems to just need time, but will put him into the rotation late for the start of the season. Walker’s shoulder discomfort is disconcerting, and reminiscent of Danny Hultzen’s problem last year. Hultzen’s injury cost him most of last year, all of this year and threatens his career. Is this the case with Walker? Who knows? But this rotation looks scary thin with Felix, maybe Scott Baker, and three very young players right now. Randy Wolf, age 37 and coming off Tommy John surgery is scheduled to start today’s Cactus League game. Hello Jeremy Bonderman. Will the M’s make a move to shore up what was already a thin rotation before the injuries? Not many options left on the free agent market. Ervin Santana, Joe Saunders and dreck. Possibility of a trade with the loser of the shortstop battle. It’s hard to imagine the M’s won’t do something whether it’s a grab for Santana, or a grab from the junk pile, but Zdurencik ain’t talking. Will James Paxton, Erasmo Ramirez, Brandon Maurer, Blake Beavan or others seize the opportunity to provide effective performance at the back end of the rotation? Isn’t this the question every team has each year? It might be the key question to the success of the season. Despite what they accomplish in Spring Training, we can’t know the answer until the season starts. The bullpen went from being a strength in 2012 to being a serious weakness in 2013. Same guys, how did it happen? Was it Wilhelmson’s lack of confidence? Was it the outfield defense? Will Rodney be the astonishing pitcher of 2012, or merely the pretty good pitcher of 2013? Or something else? How will Danny Farquhar fit in as a set up man? Who will join Rodney and Farquhar in the bullpen? What leads us to be they’ll be any better than last year? What about Oliver Perez? While Robinson Cano was a wonderful signing, Corey Hart merely replaces Kendrys Morales’ bat and Michael Morse’s glove. Logan Morrison is Raul Ibanez. Zdurencik merely replaced missing pieces, and it remains to be seen whether they are better or not. Cano is the real improvement on the team. If the M’s are going to take the next step, it’s the young guys that will take them to .500 and beyond. At the plate I’m talking about Justin Smoak, Dustin Ackley and Michael Saunders. Dustin Ackley has 1,471 major league at bats, and so far has been a disappointment. Sent to the minors to find his swing and his confidence, he returned to the M’s in the second half of the season with a solid performance. Ackley finished the season in the outfield with a .253/.319/.341 slash. But during his return from Tacoma he was .285/.354/.404. Which player is he? If he is the first guy, he probably doesn’t have a future as a major league starter. If he is the second guy, maybe he hits near the top of the order. Michael Saunders is a whole pile of unfulfilled promise. After seeming to advance his career in 2012, his 2013 season was derailed when he injured his shoulder chasing a ball into a wall on April 11th. He never really seemed to recover after missing 15 games. Off to a promising start, Saunders finished the season at .236/.323./.397, down from his 2012 stats. It is clear Saunders’ position is under fire from younger players. This is likely his last shot to take this job and make it his. If not Almonte and Avery will be waiting in the wings. And then there is the pitching. The M’s resisted the temptation to dive into the Tanaka bidfest, or take on the other available pitchers-Ubaldo Jimenez, Matt Garza, Santana, Ricky Nolasco, Chris Capuano, though they did take a flyer on Scott Baker recovering from Tommy John surgery. With Iwakuma starting behind schedule to make at least the first couple of times through the rotation when the regular season starts, it looks like Felix, Baker and a bunch of kids, maybe Wolf. Last year the M’s were completely undone by lack of production in the 3-5 slots in their rotation. For the M’s to have any hope of .500, let alone contention, Baker and the young pitchers will have to produce. We don’t have any idea how they will fare because they have no major league record. I think it’s unlikely. They should improve but I don’t see them as much more than an 81 win team, and honestly they could easily be a 75 win team. If they go all Boston Red Sox, then anything is possible. I believe the real key to the season is whether those young players we’ve been waiting for-Smoak, Ackley, and Saunders are able to up their game and show us they belong, combined with the young starters being decent. This team is thin and can’t afford injuries, and they’re counting on players like Hart, Morrison, Baker, and Iwakuma who have had a history of injury. Right now, they look like they’ll beat Houston, but the Angels, Rangers and A’s look out of reach.